Who’s Afraid of the Alligator Gar Fish? What’s the big deal with Alligator Gar? Apparently, this large crazy looking fish has fans, as well as some folks who would just as soon not have them around. This can be attributed to a lot of misconceptions pertaining to the fish. For one, it is often blamed for the loss of some local favorite game fish species. Yet, more and more people are targeting them because of their size and mighty fighting ability. These misconceptions relating to Alligator Gar have earned the fish several nicknames as well as a larger than life reputation creating considerable notoriety for this creature. Well, it is high time to debunk these myths and give this fish the proper recognition it deserves. 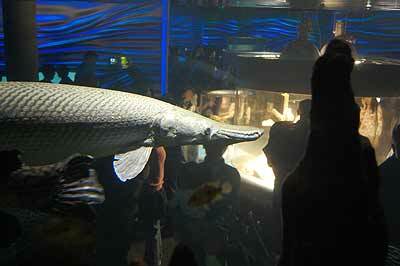 It is believed that Alligator Gar have existed since prehistoric times. This creature derives its name from its toothy snout which is similar to that of an alligator with its two rows of dagger-like sharp teeth. The tail end of this creature is olive or brown in color and the frontal area is sometimes lighter in color. This color combination allows them to hide in dark and murky waters. The fish also has interlocking diamond shape scales which can be created into jewelry and are actually worn by Native Americans. The scientific name, therefore, of the Alligator Gar Fish is Atractosteus spatula. 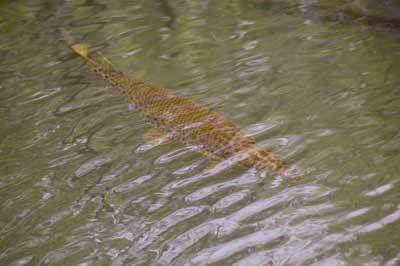 Alligator Gar are predominant in fresh waters such as swamps, large ponds, lakes, and rivers. They usually hide in dark and brackish waters where you will have great difficulty recognize them as their coloration easily blends them with the water. There are reports though that they extend their habitat into saltwater at times. According to further reports, Alligator Gar Fish are usually found in the Lower Mississippi River up the estuaries of Mexico and this includes the slow flowing waters of western states such as Texas, Alabama, South and North Carolina, Tennessee, Oklahoma, and Arkansas. There are, however, some reports that this creature is also found elsewhere outside the U.S. such as in Indonesia and Hong Kong. On January 23, 2008, a Malaysian was reported to have caught an Alligator Gar Fish in his country and it raised an alarm to the government over the possible impact and effect of this fish to their country’s own fish population. The pre-mating season of the Alligator Gar Fish typically occurs between April and May, and spawning season is between April and June with a period of dormancy normally happening from December to February. However, there are occasions when this cycle is not followed, this is due to environmental factors such as location and water temperature. Normally, spawning happens when water temperatures approach 73 degrees Fahrenheit. With the help of her male suitor, a female Alligator Gar places her eggs to be fertilized in vegetated bodies of waters that are shallow, slow moving, or calm waters which are close to deeper body of waters like tributaries, backwaters, or sheltered deep water regions. The eggs hatch within two to three days after spawning. After hatching, the larvae stay on the protective halo for some days, after which a baby Alligator Gar will swim from one place to another, feasting on food. After five to ten days, the protective band is absorbed by the water and the young Alligator Gar Fish starts to feed on plankton, amphibians, and other critters until they are able to thrive exclusively on fish. The growth and development rate of the Alligator Gar Fish is rather fast and it is not rare to see a young gar develop rapidly to one foot a year after they have hatched. One of the reasons for the occasional early demise of this creature can be due to cannibalism. Alligator Gar are often trapped in man-made or natural barriers, when this occurs and food resources deplete, they tend to eat their own kind. The average lifespan for males is an average of 26 years while females tend to live longer with an average lifespan of 50 years. There are not many known predators to the Alligator Gar Fish, however real alligators are known to try to feast on this fish. Catching an Alligator Gar can be a challenge indeed. For one, the population is not that large, thus, it is quite a feat to catch one on your first attempt. Second, there are already regulations in place to prevent over fishing of this fish which may limit fishing opportunity. To those who want to know more on how to catch them despite these known limitations, here are some ideas. 1. Bow fishing – is a common method of harvest. As the name suggests, it uses a bow and arrow. To some, bow fishing is really the most exciting method, as it combines both fishing and hunting skills. 2. Angling – This of course is fishing that utilizes the hook, line, and sinker approach. This is more taxing as it involves tackling a hundred pound fish with a rod, and you have to be sure that you are up for it. Heavy tackle is required to land these fish and many anglers looking to keep the fish after it is landed, carry a firearm to dispatch the fish. 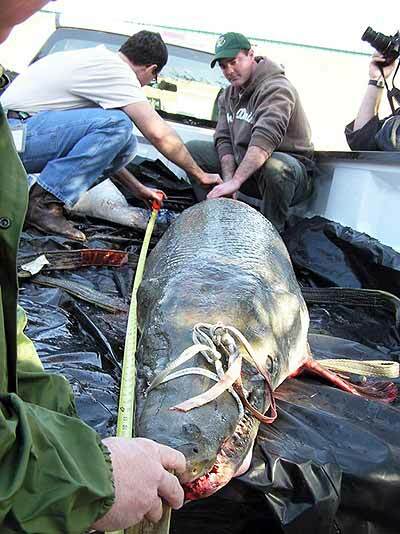 The larges Alligator Gar caught on rod and reel, is recorded at 279 pounds. On February 14, 2011, the news reported that commercial fisherman Kenny Williams caught a world record Alligator Gar weighing 327 pounds in one of his Buffalo Fish nets! Picture to the right. Planning to catch a live Alligator Gar Fish is no laughing matter. You have to remember some important points for successful Alligator Gar Fishing. 1. Use bait generously. It simply means that you have to use a fair sized bait and use anything that is preferred by the fish such as suckers or shiners. 2. Secure fishing licenses when you have found the right location to fish them. 3. Use precautionary measures. Remember that the Alligator Gar Fish is huge. You never know what will happen. 4. Even if you catch a small gar, be careful bringing them in the boat. You have to still the fish and fight against it. The fish tends to thrash about and may get one of those teeth into you, or cut you with their scales, a heavy pair of gloves can come in handy at times like this. When you see and observe an Alligator Gar at close range and for an extended period of time, you might think that this creature is not intended for the aquarium. However, this fierce looking carnivore is considered a pet for some. But before you fall for the same notion, there are some preparations and conditions to consider before trying to keep or breed an Alligator Gar. 1. 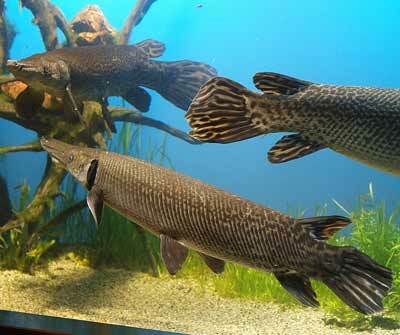 Typical Alligator Gar are usually large, therefore, you need a tank or a big pool where you can keep them for breeding. It is a demanding water animal and it needs a huge space and clean water. It is recommended that you have an aquarium or tank that can hold at least 1,400 liters of water. 2. If you want to keep other fish in cohabitation with Alligator Gar, be sure that the pond or tank is large enough for all of them. If you provide a very large living space, you can actually keep quite a number of Alligator Gar and these fish tend to school together. 3. Water temperature should be maintained from 61 degrees to 86 degrees Fahrenheit. In addition, Alligator Gar have the ability to breathe air and, therefore, you should allow space at the top of your tank so that they can use plenty of fresh environmental air. 4. Feeding is not a problem, as they eat almost any aquatic fish or amphibian that is of a manageable size for them to swallow. 5. There are cases where Alligator Gar and other gars have been known to reproduce in tanks and aquariums, however they tend to reproduce better in their natural habitat. 6. Do not forget that the tank or aquarium should more or less reflect their natural habitat. The scales of this large fresh water animal are very strong and they serve as thick armor to protect themselves from stronger water predators such as Alligators. Thus, North American natives have used this part of the Alligator Gar’s body to tip their arrows with, and also as protective body armor. Native American women have also been known to create jewelry from the scales of this fish. While this practice is not prevalent, some people have considered Alligator Gar meat to be tasty and a treasured delicacy in places like rural Mexico. But above all this, fishermen simply love the challenge of fishing for and catching this large aggressive fish. There is great enjoyment and satisfaction, gained from catching one of North America’s largest freshwater fish! Sport fisherman often blame this creature for the dwindling population of some of their favorite game fish species such as bass. 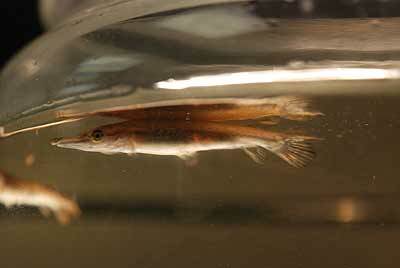 As pointed out earlier, gar fish are carnivorous and will often eat anything that moves and is not bigger than them. There is no conclusive scientific evidence pointing to them as the real culprit for low fish populations in some areas. Despite this, the population of Alligator Gar Fish is also decreasing due to habitat loss or modification. 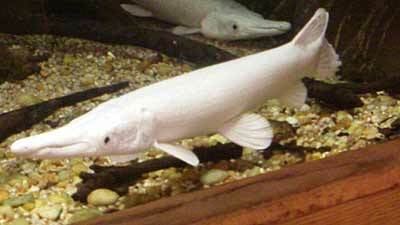 Another reason why the Alligator Gar is disliked is due to its appearance. Some people mistakenly believe this fish to act like a real alligators and, this has earned the gar a reputation as being even more vicious than some types of shark. There is absolutely no factual evidence that proves that Alligator Gar are hostile to man, but stories still keep sprouting up! This creature is not on the list of endangered species yet, but over harvesting of this fish and habitat loss are becoming more and more detrimental to its ability to sustain viable populations. It's hoped that studies will reveal how man can help the Alligator Gar Fish population while at the same time maintaining the number of other fresh water species within the same environment.